Here’s what’s up in the world of TV for Tuesday, June 27. All times are Eastern. 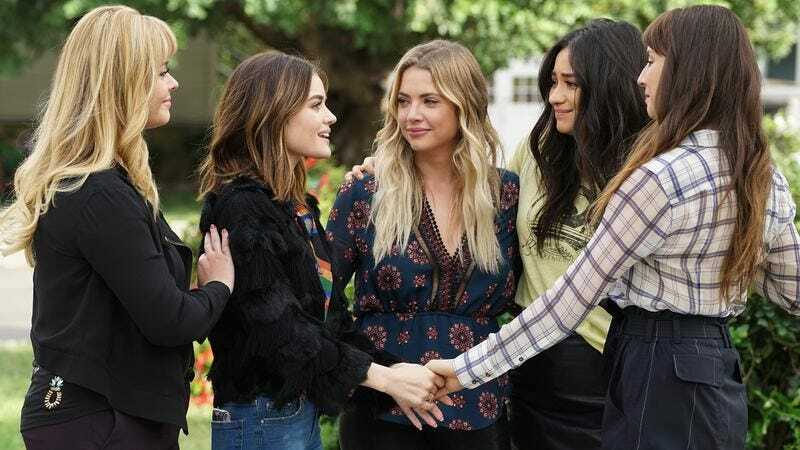 Pretty Little Liars (Freeform, 8 p.m.): Even if you haven’t kept up with Pretty Little Liars, you may want to bid goodbye to the gang on their final outing. Freeform’s official synopsis promises that “seven seasons of secrets come tumbling out in the two-hour series finale.” Executive producer I. Marlene King has told TV Line that this means you will finally find out who A.D. is. Downward Dog (ABC, 10 p.m.): And now we pivot from a show that may have outstayed its welcome to one gone too soon: It’s time to say farewell to the sweet pooch at the center of Downward Dog as it airs its final two episodes back to back. ABC declined to renew the show, but along with show creator Samm Hodges, we have faith that some other outlet will see the genius and compassion in the talking dog show and pick it up. Besides, Downward Dog stars Allison Tolman and Ned are among the most delightful guests The A.V. Club has ever had.